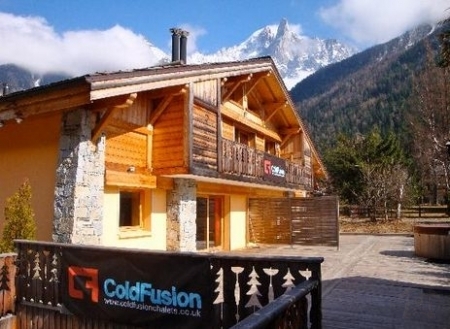 Chalet La Flegere was constructed exclusively for Cold Fusion in December 2005. With its modern furnishings and spacious layout, the chalet can comfortably accommodate 18 Cold Fusion guests. The chalet features 9 large twin bedrooms spread out over 3 floors, 7 out of 10 bedrooms have their own en-suite facilities including shower, WC, hand basin and heated towel rail, and the remaining two bedrooms have an allocated bathroom nearby. Linen and towels are provided. Breakfast, afternoon tea and evening meal are served in the large dining room on the first floor. All 18 guests can dine together whilst watching the sun set over Mont Blanc through the large French windows, opening out onto the balcony offering breathtaking views over the Mont Blanc Massif. We have an individual approach to Mealtimes. See our Menu Plan for the week. Chalet La Flegere offers 3 social lounge areas in which Cold Fusion guests can socialise. The first lounge area boasts a large television with satellite channels, DVD player with film library and Play Station 2 console with games. Adjacent to the television room is another communal area, where guests can read, play board games or use the PC with complimentary Internet access, including a wireless Internet connection for those wishing to use their laptops. The third lounge is situated next to the dining room and kitchen. Guests can enjoy a complementary glass of wine or beer before and after dinner in front of a wood burning fire, whilst admiring the views of the Chamonix valley through large French windows. The coffee and tea station and hi-fi system make this a great place to socialise at any time of the day or night. Recently constructed for the winter season 06/07 were a large heated outdoor hot tub and a sauna. Cold Fusion guests can soothe away their aches and pains in the hot tub situated on the terrace just in front of the chalet, or in the sauna. Brand new for the winter season 07-08 Cold Fusion are opening an underground Bar & Games Room! This will be an area where people can come and socialize in the evenings with a fully stocked bar, Darts Board, Giant Jenga, Karaoke, music, and plenty of other activities. This area will be open to Cold Fusion guests from both chalets every evening allowing guests to socialize until the early hours of the morning if they so wish! 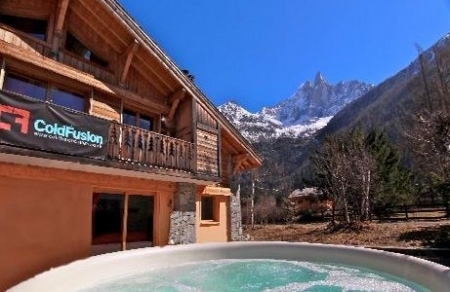 Situated in the hamlet of Les Praz, in the heart of the Chamonix valley, the chalet lies within walking distance of 2 of the 5 ski areas in Chamonix and within proximity to the town centre. Cold Fusion also provides a private minibus to transport you around the Chamonix valley, giving quick and efficient transfers to all the different ski domains each day of your holiday. A free bus and train service also operates frequently from Les Praz to all of the ski domains and also to the town centre, running from early morning until the evening. Prices are based on two people sharing a twin bedroom. 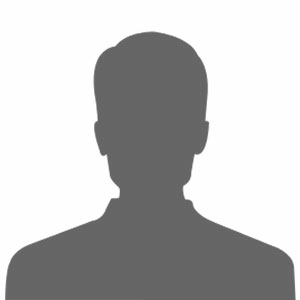 Room share is allocated on gender and age range.